PROCEEDINGS. Line a mold with a sheet of plastic wrap. Cut the sponge cake into two disks of 1cm. thick. Cut rectangles from what remains of the first disk and a second part of (should be enough to coat the inside of the mold). The rectangles must have a width of 4 - 5cm. and must be long enough to get almost to the edge of the mold. Lightly brush the sponge cake with the liqueur. Peel the kiwis and wash the strawberries, apricots and plums. Pat dry and cut into cubes 1/2cm. the pulp of apricots, plums and kiwis. Sprinkle the fruit with 20gr. sugar and moisten with lemon juice, then tenetene by 1 / 3. In a small saucepan put the butter, cocoa powder, 80g. sugar and 2 tablespoons water. Bring to a boil over low heat and cook for 5 minutes without stirring. Remove from heat and let cool. Meanwhile, whip the cream with the icing sugar, if using a hand blender (first minute) and if you use an electric mixer (5 minutes). Then take 1 / 3 of cream and embed them in the cocoa cream. Fill the mold with the cream to fruit, livellatela with the spoon and close the other filled with rectangles of sponge cake, you have obtained from the remaining part of the second disk. (No matter if they have irregular shapes because rettagoli remain hidden under the sweet) Brush them well with a little liquor, cover with plastic wrap protruding from the edge of the mold. On the surface of the cake, into the mold, settle yourself a plate that comes to size and put a weight on top. Cool the zuccotto least 5 hours and 1 / 2 in the coldest part of refrigerator, then pass it in the freezer for 30 minutes. Remove the plate and the weight from the surface, widened the film that covers it, flip the mold onto a serving dish and sfilatelo. Gently remove the film from the sweet, very careful not to raise even slices of sponge cake. Keep cake in refrigerator until serving. Pour 200ml. cold cream in a bowl and mount it with a fork or a whisk until slightly thicken (2 minutes will suffice). Join the pieces of fruit that you have kept aside and mix well. Serve the cake with a little sauce, until it has been dusted with cocoa powder and the coating of sponge cake, is on the sauce. COUNCIL To fill the mold evenly well you take the sponge form of the bottom, squeezing gently with your hands. When sprayed with the liquor be careful not too wet, just wet it, otherwise it transforms. For a tasty variation, instead of diced fresh fruit, you can enrich with white cream 50g. of diced candied orange and citron, mixed together with 50gr. Bitter dark chocolate chips and 30g. fresh peeled pistachios. If you are on a diet but still delicious, replace the cream with 700gr. lean ricotta worked 5 minutes with 2 packets of sweetener diet. Stir in 1 / 3 of ricotta 30g. unsweetened cocoa powder and the remainder of the diced fresh fruit. Do not brush the sponge cake with liquor but with a syrup made by boiling 5 minutes 1 / 2 glass of water with 10g. sugar and lemon rind. 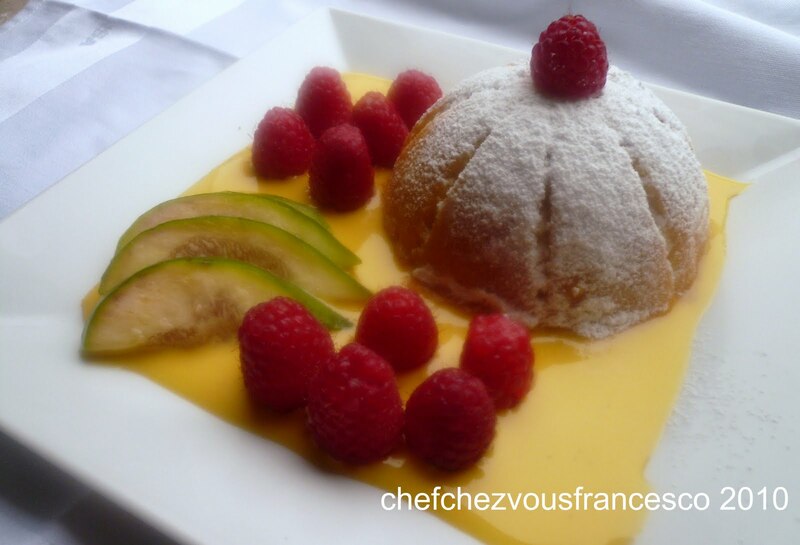 Do not serve the cake with the cream sauce but only with the diced fruit naturally, without adding either sugar or lemon juice. If you hurry, add 7.5 g cream. softened gelatine sheets in cold water 10 minutes, drained and dissolved in 2 tablespoons sweet fire of liquor. Add the dissolved gelatin and cooled (but not yet solid) with cream, before installing it. In this case it is necessary to keep the mold in the freezer, but will be just 3 hours in refrigerator.